Growing up, I received conflicting views of women. I had heard how independent, strong and powerful women can be and I soaked that up like a sponge. When I’d daydream about my future, as young children do, I always saw myself as one of those successful strong women that didn’t have to depend on a man. At the same time, I was also hearing the stereotypical opinions about women from the media and men around me. Women belong barefoot and pregnant in the kitchen. A woman is supposed to obey her husband. Women should be at home cooking, cleaning, and looking after the children. When I heard these words I took them as old jokes. Ideas from the past. When I turned 18 and moved away from the city that I grew up in, I quickly learned that equality is an illusion. It was not long before I realized that I was being taken advantage of because of the way I looked. I’d be taking care of simple adult responsibilities and I noticed that I was being treated unfairly; like men weren’t taking me seriously. It made me feel like these men saw me as stupid…and then I started to wonder if I was. One of the first things that sticks out in my mind was when I was getting a cartilage piercing. I was with a group of my girlfriends when I got slightly distracted while paying. The man who had done the piercing ripped me off $40. At first I thought this was a one-off bad experience, and I blamed myself for not being more vigilant. But then I noticed things like that happening more often. When I was trying to get other things done alone, I found that men would not take me seriously and I would end up calling my dad, boyfriend, or even my younger brother because they would listen to them. They were heard. They were respected. I was not. For the first time in my life, instead of seeing myself as strong and independent, I saw myself as weak and vulnerable, like a target. The idea that I had in my head of women being treated equally and that oppression was in the past, couldn’t be farther from the reality that I was experiencing. Even now I have to fight to be listened to. Men still yell out their windows when I’m walking to my car, they say inappropriate things to me at my jobs, they take it upon themselves to decide what I should do with my body. From little things like what I should wear, to bigger issues like the constantly changing coverage of my birth control, it seems like the opinions of men are constantly being projected on me. I have experienced these things from men of all ages. I will not let another man get away with casually telling me that I “would look much prettier if I smiled for him”, because women are not here to serve men, we are here serve ourselves. 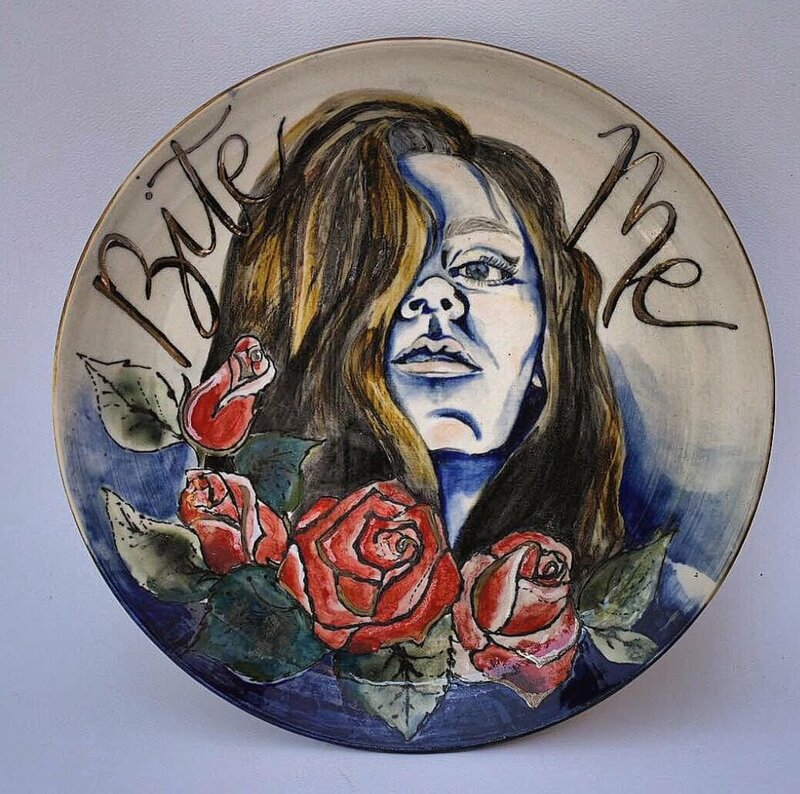 The phrase I chose for my plate is “Bite Me”, because I know women aren’t treated equally, I know that we aren’t respected. Instead of timidly standing back and “dealing with it,” I am demanding respect.